Its great. Expensive, but great. Just quit smoking and put the $1500/yr into this for 2 yrs and its free. And figure you will keep it forever so not too bad. This really makes me want to get out on the water. Sooo much better than paddling, faster, more efficient, good workout too.. It handles very well for such a big boat. The only real draw backs I can see so far are : price (its about $1K over priced), weight - very heavy, you almost should not put this on the roof of a car, and it cant be used with the mirage drives in shallows like in rivers (such as the Hooch). For ponds, lakes, or ocean, this thing simply cannot be beat. You can cruise along at 5 mph with no problem, you can add a sail kit, outriggers, elec motors, you can even troll off it just with the pedal drive. In fact, Im taking my 6yr old out in it now to go for some bass in the neighborhood pond. I only wish the pond was bigger, we can scoot across it in 2 minutes. Hobie has done this right. Yes you can buy a 90 hp bass boat with a trailer for about the same price on craiglist. But you wont get to go in neighborhood ponds, small lakes, reservoirs, or off the beach at Grayton in 1 of those. And a $3K bass boat will eventually leave you stranded and cost more like $6K in a year or 2, whereas this likely will not. Wish it were little less expensive, but I'll get my $ worth outta this thing ! Get it in blue, its beautiful. 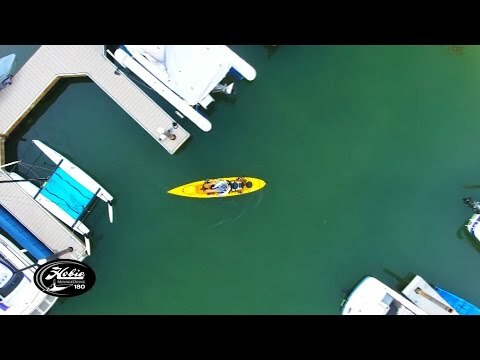 I really like the Hobie Mirage Oasis Tandem Kayak that I recently purchased. For a large kayak it moves quite fast with the turbo fins. Most of the time, I use it by myself for kayaking and fishing in the ocean. The Mirage Oasis has a lot of storage room and I especially like the large storage area at the front of the kayak. Where I can keep a lot of miscellaneous items. The Mirage Oasis Tandem is very stable in the ocean and I am never afraid to getting swamped or tipping over. There's also 3 in the hull strorage areas, 2 are right in front of the seats, which is very handy to store fishing stuff or food to eat. The boat is quite heavy and you will need some strong racks and accesories to transport it. I ended up buying Yakima racks with rear Hully Rollers and front saddles. When the Oasis is strapped down, it is really secure and I can zoon down the freeway at 70mph without worrying about my kayak moving around. I would recommend that you buy the heavy duty cart for transporting your Oasis on the ground. I also purchased the ST Turbo fins for a little extra pedaling power and 4 fishing rod holders installed in the front seat and back seat areas for fishing. Great buy, like working out in the gym, but your one the water and moving quite fast. I am also a swimmer and have noticed that my leg strength has really improved. Beats going to the gym to work out my legs. The Oasis is an excellent kayak for my needs. ACK delivered the product in a very timely manner. I had a couple rudder issues that eventually were resolved, but it took longer than it should have. Awesome little boat. Great stability. Fast. Fun. Lots of great features. Plenty of storage. Beautiful. The only downside is the weight, but even at 70- something pounds, I am able to get it on top of my car by myself. Best buy I've ever made. Buying from Austin Kayak was also great. Quick and delivered to my driveway. I was very happy ordering from Austin Canoe & Kayak. Delivery was quick and tracking info was provided as soon as it was shipped, although I was surprised to find that the shipping company would not lift the kayak off the truck and put it at my door, so I had to ask my brother-in-law to help. This kayak can handle 3 people (children) as long that it adds up less than 550. I just order the Hobie Sail for this kayak from Austin because it would be awesome and I know Austin would provide excellent service. The first week I took it camping, all 20 people took turn using it. Before the first use I would recommend you to get some UV spray protection from an automotive store because the tiny bottle that came with it is not enough. The insert cart is also a must have with this kayak, makes life a lot easier. This is a Hobie so I also recomment getting a lock and cable ($19 at Home Depot) to secure it where ever you go. I think my gear bucket was taken when I had it on my roof rack over night. People will be eyeing for the name Hobie. I also bought the Hobie fish finder kit and turbo fins. My wife and I are new to kayaking so we don't have anything to compare it too other than a Hobie Outfitter that my sister has. We love it. It is fast. Wife and I went out with a co-worker & his son on their canoe. Before we knew it, we were several hundred yards ahead of them on our Oasis. We really like the dual steering, that has come in handy several times. If you have room for the extra 2 feet, you will like the extra storage that the Oasis has over the Outfitter too. The 2011 Oasis comes standard with the large sailing rudder so don't order one like I did!! No worries though, ACK handled the return without problem. Overall I am extremely happy with purchase. My only complaints would be one that I anticipated and one that I didn't. You do have to be cautious with the fins in shallow water. As I use my kayak primarily in tidal salt marshes and flats the tide charts are all important. The kayak is so much fun to use with the mirage drive that at low tide I wont bother going out. The other complaint I didn't anticipate is that when seaweed and eel grass get caught on the fins it is as if someone dropped an anchor. One day coming back in with tide we were having to pull out and clear the drive every few minutes. Not much fun. We love our new Oasis. We have rigged it for fishing as we live on the North California coast. It is plenty stable and once fitted out makes for a great fish hauler. The only problem I have with it is trying to get the awkward weight of it up on my Volkswagen Vanagon. The Thule Hullivator has helped a lot. The boat is very fast and we are learning to take all the drives up and rudder up when going in the kelp. 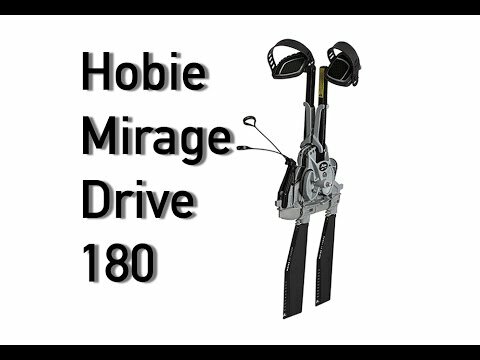 The Hobie Mirage Oasis Kayak is fabulous! Drive system works like a charm. Accessories are great. Rudder pin is cheap plastic. The kayak needs more carrying handles for its 75 lbs size, but you can buy those and add them on yourself. Lots of fun this summer with this unit but am having difficulty finding information on rigging it up for fishing. I wonder where Dan S. mounted those fly rod holders... would love to see a picture. Best regards G.
My husband and I have had so much fun with the Oasis that we added to our fleet with a Revolution. Now our German Shepherd gets the front spot on the Oasis. It is fast for the amount of effort and is quite maneuverable. The transport cart is a must and is easily stored on the kayak for quick entry/exit at the launch area. All of the essential accessories are included, so you don't feel 'nickeled and dimed' -you're ready to go the minute you unwrap the package. Awesome kayak. Going to use it for fly fishing, so I bought Scotty fly rod holders for it. Also bought sail kit, very fun to use on a lake. Recommend buying the dagger board if you get a sail, as in strong wind it is a little tippy. Going to buy outriggers next so it is a little more stable when fly fishing. Taking it on a river trip this weekend. Very fast and stable kayak. Pedals easily and reaches speed of 4 MPH with very little effort. The wheel option makes it very easy to get from the car to the water, it is very evenly balanced. Can't wait for the next adventure. Get one you'll love it. Q: I have an older Oasis and I would like if I can just get the hull and chairs. No oars or mirage drive? Q: while most of my fishing is open water, there are times I want to kayak a few shallow rivers with level 1 rapids. I have my son with me so a tandem kayak is essential. Can I paddle the oasis well/easy without the mirage drive in? Does the Oasis handle well in this environment? A: Hi, thanks for the question. At 127 pounds, this tandem kayak is heavier than most. It will not be the easiest kayak to maneuver through tight river scenarios. Q: Will the Sea to Summit Kayak Cart - Medium work with the Oasis Tandem? A: Yes, this kayak is 127 pounds and the Sea to Summit Kayak Cart has a weigh capacity of 154 pounds.